Did you move from using a church accounting software to using QuickBooks Online to run your ministry? Are you struggling with tracking your funds in QuickBooks Online? Don’t know how much you spent over the years in your ministry’s mission fund? Don’t know if the available cash in your bank account belongs to your general fund or is restricted? Read on to learn how to create a Fund Balance Report in QuickBooks Online. A fund balance is your church’s net assets after meeting your liability obligations. The fund balance report shows the accumulation of your ministry's surplus or deficit (aka net revenue or loss) over the years as net assets. You need to track and monitor your fund balance to know how well your ministry is performing in terms of profit and whether your funds are matching with your bank available balance. Knowing your fund balance for each functional area of your ministry eliminates year-end cash flow surprises and conflicts between your ministry’s divisions. QuickBooks Online doesn't have a Fund Balance Report as one of the standard reports. You have to use a Custom Summary Report and customize it to get a fund balance report. Your funds must be set up as classes using the class tracking feature in QuickBooks Online. You need to make sure all of your income and expenses already have classes assigned to them. You also need to have done the year-end reallocation of each fund surplus or deficit (net income) amounts to the net asset accounts for prior years. Ready to learn how to use QuickBooks Online to run your ministry? Get access to 30+ training videos, downloadable templates, and an e-book to use in managing your ministry’s finances. I am using my Fire on the Mountain Church sample file in this tutorial. To get started, follow the steps below. Log into QuickBooks Online. Click on the Reports tab, then select the Standard Reports tab. Scroll down to the Business Overview section to locate and click on the Custom Summary Report. In the report screen, click on the Customize button. Continuing with the customize report screen, expand the filter section, click the drop-down option next to the Distribution account. Scroll down in the customize report screen. Change the report title to Fund Balance Report and uncheck the Date prepared and Time Prepared. Click Run Report to run the report and exit the customize screen. Your report will look like the below screenshot. Now to verify the accuracy of the total fund balance amounts, right-click on the reports tab to open it as a second tab in your browser. In the Standard Reports section, locate and click on the Balance Sheet Summary report. In the Balance Sheet Summary report screen, update the date range to All dates to match the same date range we used in the Custom Summary Report. Compare the total bank account amount to the Fund Balance Report total. You will notice that both total amounts should are the same. Save the report for future use and easy access using the Save Customization button and share with your team. If your total amounts do not match or if you are getting the Not specified row with amounts in the Fund Balance Report, click on the total amount to review the individual transactions. Make sure all transactions are assigned a class and recorded correctly. Apply any outstanding unapplied bill payments to bills. Double check your journal entries to make sure they all have assigned classes. 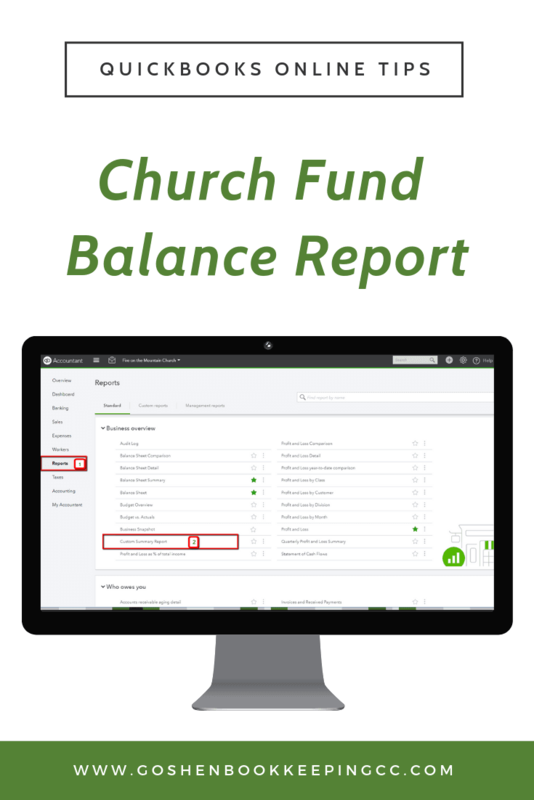 Now you know how to create a Church Fund Balance Report in QuickBooks Online to track your ministry funds and determine how much of your bank cash is available for operating and how much is restricted. Feel free to share this QuickBooks Online tip with other users. Contact us if you have any questions.